Farmer Meg's Digest | Upcoming Classes and Workshops for 2011! Home » beekeeping » Upcoming Classes and Workshops for 2011! Upcoming Classes and Workshops for 2011! Posted December 30th, 2010 by Meg & filed under beekeeping, gardening. With all of the classes I have lined up next year, I think it’s safe to say that the start of 2011 is gonna be a real doozy! I’m not complaining though. I’m super pumped about it! To those who have expressed interest in learning about urban food production on an individual scale, I will list the classes I have lined up so far with links to where you can enroll! I hope to see many of your faces in some of these classes and I hope to meet many new, wonderful folks too! Sunday, January 23rd Growing Mushrooms Indoors at Rose Red and Lavender 10 a.m.
Wednesday, February 16th Urban Food Production for the Landless at 3rd Ward. 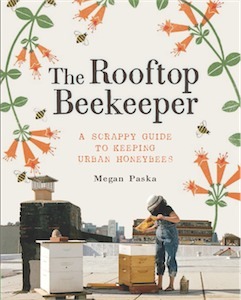 7 p.m.
Saturday, February 26th Rooftop Beekeeping 101 Learn the basics of Beekeeping in NYC. This class is divided into two 3 hour sessions. The second class will take place on Saturday, March 5th. At 3rd Ward 2:30 p.m.
Tuesday, March 1st Vegetable Gardening at the New York Botanical Gardens. Learn about soil preparation, crop planning, cultivar selection and more! This is a 12 hour certificate course which takes place on 3/1, 3/8, 3/15 and 3/29 @ 6:15 p.m.
Saturday, March 12th Designer Chic on a Dime at the New York Botanical Gardens. Learn how to turn your grey city backyard into a verdant oasis without breaking the bank! 10 a.m.
Saturday, March 19th Beekeeping for Bee-ginners at the New York Botanical Gardens. Learn the basics of Beekeeping so that you can start your own apiary this Spring! This class is a 9 hour course and takes place over 3 sessions on 3/19, 3/26 and 4/2 at 10 a.m.
Saturday, March 29th Vegetable Gardening at the New York Botanical Gardens Learn about soil preparation, crop planning, cultivar selection and more! This is a 12 hour certificate course which takes place on 3/29, 4/5, 4/12 and 4/19 @ 10 a.m.